Download and extract the Android SDK. Connect your physical Android phone via USB. Download apk files. Note that Phonesky.apk may be called Vending.apk on older phones. Unplug your Android phone. 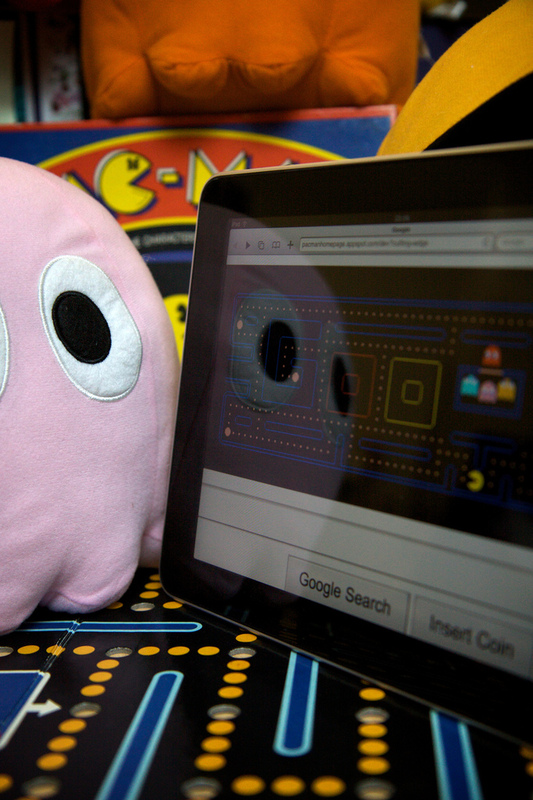 This prevents error: more than one device and emulator when copying the apk files. Start the emulator, replacing <avd> with the name of your avd. Copy apk files (after emulator starts). 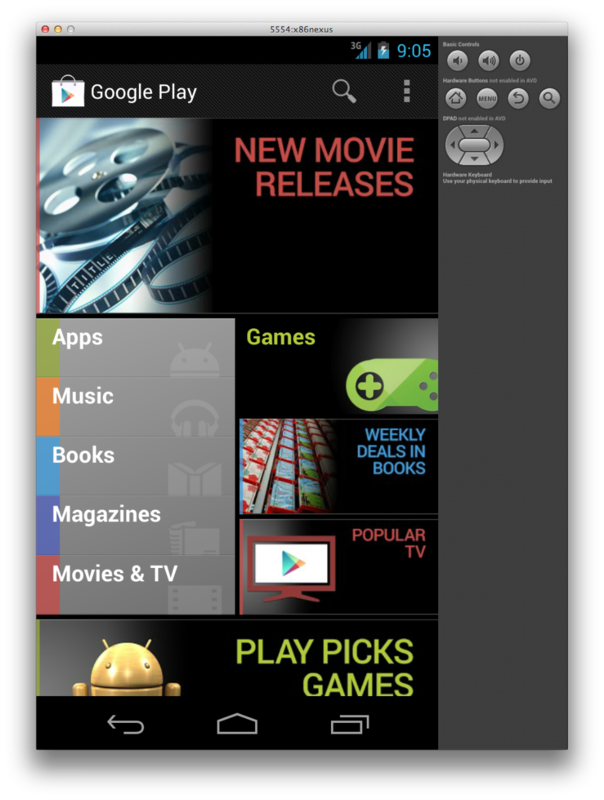 Open the Play app and log in with a Google account. I used apk files from a Galaxy Nexus running 4.2.1 Jelly Bean and Google Play Store version 4.1.10. My avd is Android 4.2.2 – API Level 17 Intel Atom (x86). If you don’t care to run a separate window manager, the Cygwin environment, or a local xterm, VcXsrv Windows X Server is my favorite alternative and comes with PuTTY plink.exe to handle SSH. To launch the Android SDK and AVD Manager on Windows, execute SDK Setup.exe, at the root of the SDK directory. On Mac OS X or Linux, execute the android tool in the <sdk>/tools/ folder. This step will add the Market app to your AVD. Unzip the file and copy system.img to the AVD folder. To locate the AVD path, select your AVD in Android SDK and AVD Manager and click [Details…]. 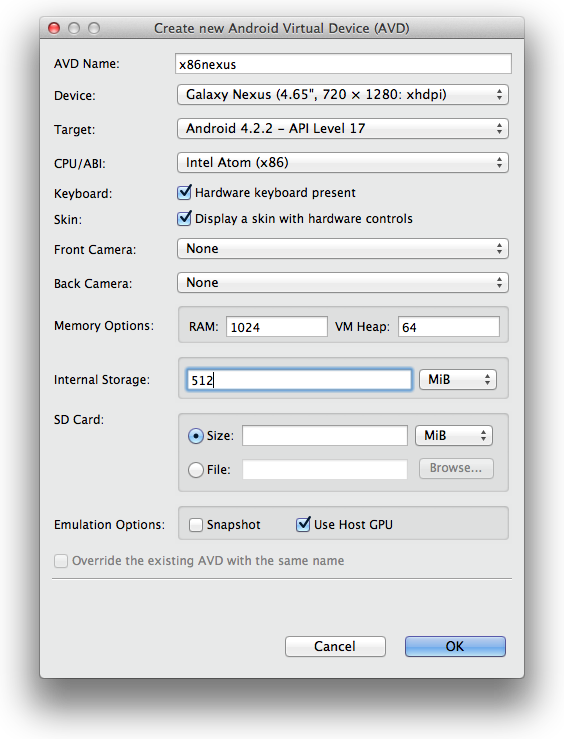 On Mac OS X or Linux the AVD should be at ~/.android/avd/MyPhone.avd/ where MyPhone is the phone name you chose when you created the AVD. On the first boot, the tutorial asks you to slide out the keyboard. Do this using Ctrl-F11 or Ctrl-F12 (see the Keyboard Mappings section below). If your AVD does not have an internet connection when it boots (sometimes it takes a while) try restarting the emulator.